The Labor Department reported sharply higher inflation in November as consumer prices rose 0.8 percent, the steepest increase in 26 months. 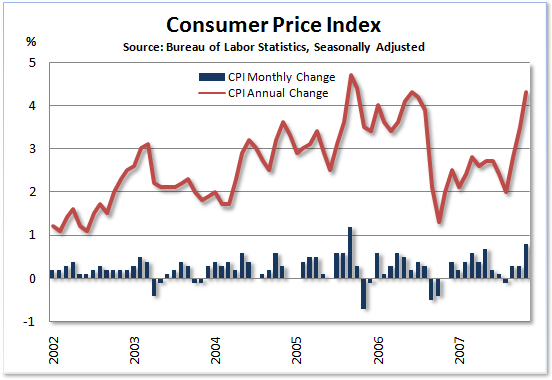 From year-ago levels, inflation was a full 4.3 percent higher, the worst year-over-year reading since Hurricane Katrina. Energy prices led the way higher as gasoline rose 9.3 percent last month and 37.4 percent from a year ago while the overall energy index gained 5.7 percent in November and 21.4 percent on a year-over-year basis. Food prices rose 0.3 percent in November and 4.7 percent from year-ago levels, so if you're a senior citizen who spends most of your money to heat your home and put food on the table, your "personal" inflation rate is probably in double-digits. Don't spend that 2 percent Social Security increase all in one place. 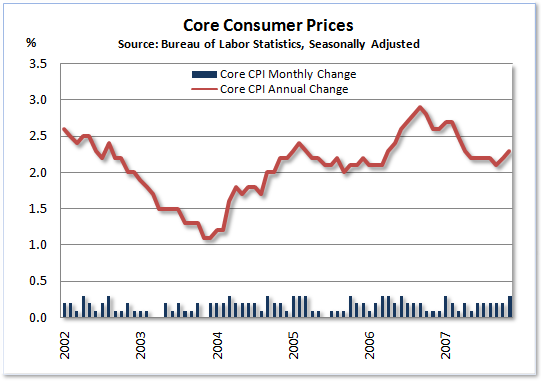 Even "core inflation" rose sharply in November, at its fastest rate since January. The preferred measure of inflation for most economists because it strips out food and energy, categories that are rising in price volatile, the "core rate" rose 0.3 percent last month and is now up 2.3 percent on an annual basis. This increase may make the task of the Federal Reserve a bit more complicated as they attempt to cushion the fall-out from the mortgage lending crisis and housing bust. Not that this will stop them from cutting interest rates - they'll just have a tougher time explaining their actions to other economists. On Tuesday, short-term rates were lowered for the third time in four months and a coordinated global plan to inject liquidity into the banking system was announced on Wednesday - there appears to be little fight left in the "fight against inflation" here in the U.S. ("vigilance" left town some time ago). The Fed lowered interest rates on Tuesday and is expected to do so again and again next year, however, since inflation is now soaring, currency traders figure that interest rates in the U.S. might hold steady or maybe even go higher, boosting the dollar's yield and maybe increasing its appeal relative to other currencies. Does anybody really think the Fed is going to stop cutting rates or raise them? As we begin an election year? That's just dumb - you deserve to lose money on that trade. As for the housing bubble and its impact on inflation, it is interesting to note the effect that housing is having now that home prices are going down. Recall that house prices are not included in the inflation statistics, but rather "owners' equivalent rent" is used. So, just as a housing boom results in lower rents when everyone is out buying their own place, reducing demand for rental units, a housing bust has a similar effect on rents as a good portion of the housing inventory glut, originally intended to be owner occupied, become rental units. It's hard to have any significant inflation in the official government statistics during and after a housing boom when you only use rents. Had real home ownership costs been included in the inflation statistics, much of what we are now seeing in housing and credit markets could probably have been avoided.